Intermediate Music for Four - Volume 2 - Set for String Quartet (3 Violins, Cello) 72202 - Save $4.00! Intermediate Music for Four, Volume 2 Set of 4 Parts for String Quartet (3 Violins, Cell..
Intermediate Music for Four, Christmas - Set for String Quartet (3 Violins, Cello) 73102 - Save $4.00! Intermediate Music for Four, Christmas Set of 4 Parts for String Quartet (3 Violins, Cello) 73..
Intermediate Music for Four, Volume 1 - Set for String Quartet (3 Violins, Cello) 72102 - Save $4.00! 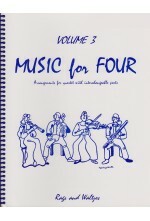 Intermediate Music for Four, Volume 1 Set of 4 Parts for String Quartet (3 Violins, Cell..
Music for Four - Volume 3 - Set for String Quartet (3 Violins & Cello) 70302 - Save $4.00! Music for Four, Volume 3 - Rags & Waltzes Set for String Quartet (3 Violins & Cello) #70302..
Music for Four - Volume 4 - Set for String Quartet (3 Violins & Cello) 70402 - Save $4.00! Music for Four, Volume 4 - Late 19th & Early 20th Century Favorites Set of 4 Parts for String Q..
Music for Four Christmas Set 75102 for String Quartet (3 Violins & Cello) - Save $4.00! Music for Four, Christmas Volume - Traditional Christmas Music Set of 4 Parts for String Quartet (3..